Chlorine dioxide (ClO2) is used primarily as a bleaching agent in the pulp and paper industry for elemental chlorine free (ECF) bleaching. Chlorine dioxide has a strong absorption between 350 and 500nm that the Kemtrak DCP007 can measure – from ultra low parts per million concentrations when used for gas detection or disinfection, to high concentration solutions used for the bleaching of pulp (>20 g/L). The Kemtrak DCP007 can be used to optimize the reaction efficiency of ClO2 generation, improve the control of vent-gas scrubbers to reduce emissions into the atmosphere and for monitoring the final concentration of chlorine dioxide product sent to the bleaching plant. Chlorine dioxide is an aggressive chemical substance – all wetted parts of the Kemtrak DCP007 flow cell are manufactured from corrosion resistant materials, such as PTFE, titanium and sapphire. 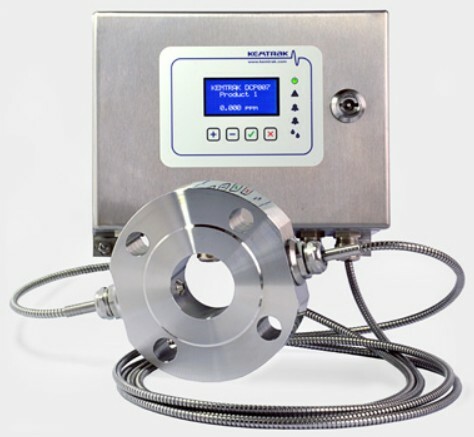 Click the button below to add the Chlorine Dioxide Meter / Analyzer - KEMTRAK DCP007 to your wish list.